Kousa, Y. A., Moussa, D. and Schutte, B. C. (2017), IRF6 expression in basal epithelium partially rescues Irf6 knockout mice. Developmental Dynamics, 2017. 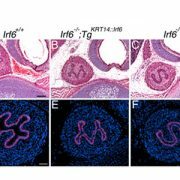 © 2017 Wiley Periodicals, Inc.
IRF6 is a gene that plays a key role in the development of epithelium, the tissue that lines the cavities and surfaces of blood vessels and organs throughout the body. Mutations in this gene are known to contribute to human diseases, including van der Woude syndrome and popliteal pterygium syndrome, both of which are characterized by cleft lip and palate, skin abnormalities and limb defects. Experimental models that are genetically modified to lack this gene typically have systemic defects so severe that they die at birth. However, it’s been unclear whether these defects are all due to problems with the epithelium and their related consequences, or if IRF6 also plays a role in other tissues during fetal development. 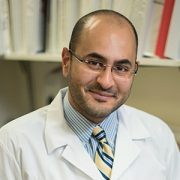 A research team led by Youssef A. Kousa, M.S., D.O., Ph.D., a pediatric resident in the child neurology track at Children’s National Health System, investigated where IRF6’s activity is important by partially “rescuing” experimental models altered to lack this gene – or selectively restoring its activity – in just the epithelium. When the resulting animals were born, they survived for hours, unlike animals that lack IRF6 completely. However, the partially rescued experimental models had physical characteristics that were intermediate between animals that were not genetically modified and those that totally lacked IRF6. These partially rescued animals still had cleft palates, skin abnormalities and limb defects, but these defects were not as severe as the modified animals that weren’t rescued at all. 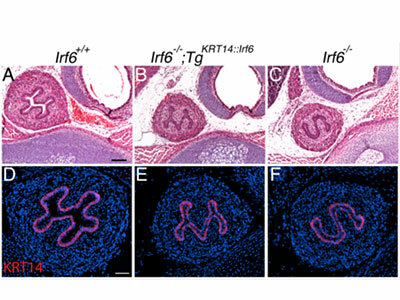 The findings suggest that IRF6 plays a role in development of tissue types beyond epithelium. Gaining a better understanding of how mutations in this gene exert their effects on this array of tissues eventually may help researchers develop ways to prevent related disorders or to treat them early in development. Q: What function is IRF6 playing in tissues beyond epithelium? Q: Which defects lead to premature death in experimental models whose IRF6 function is restored in the epithelium? Q: Is there a way to prevent defects caused by IRF6 mutations without the need to restore IRF6 function directly? Source: “IRF6 expression in basal epithelium partially rescues Irf6 knockout mice.” Kousa, Y.A., D. Moussa and B.C. Schutte. Published online by Developmental Dynamics June 23, 2017.